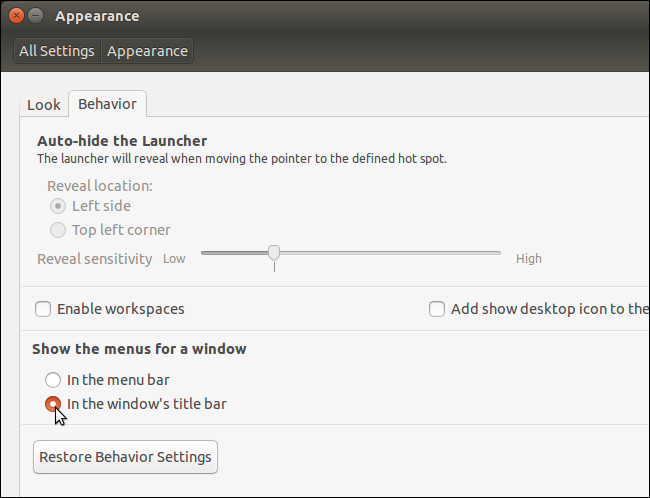 The Global menu is a feature in Ubuntu that places the menu bar for each application on the bar at the top of the screen. If you don’t like the Global menu, you can move the menu bars back to the program title bars. Disabling the Global menu in Ubuntu 13.10 involved removing a specific package that provided the Global menu. As of Ubuntu 14.04, there is now a setting that allows you to easily disable the Global menu, if you don’t like it, and enable the local menus on the program title bars. We’ll show you how to change this setting. To enable the local menus, click the System Settings icon on the Unity bar. On the System Settings dialog box, click the “Appearance” icon in the Personal section. On the Appearance screen, click the “Behavior” tab. Under Show the menus for a window, click the “In the window’s title bar” option. Click the “X” button in the upper-left corner to close the Settings dialog box. The change is effective immediately. You do not need to log out or restart. The menu bar for each program is moved to the title bar of the respective program. If you decide you want the Global menu back, simply change the setting to the “In the menu bar” option. Note that, because the menu bar is on the title bar of each program, the menus disappear when the mouse is not on the title bar. Simply move the mouse over the title bar to access the menus.